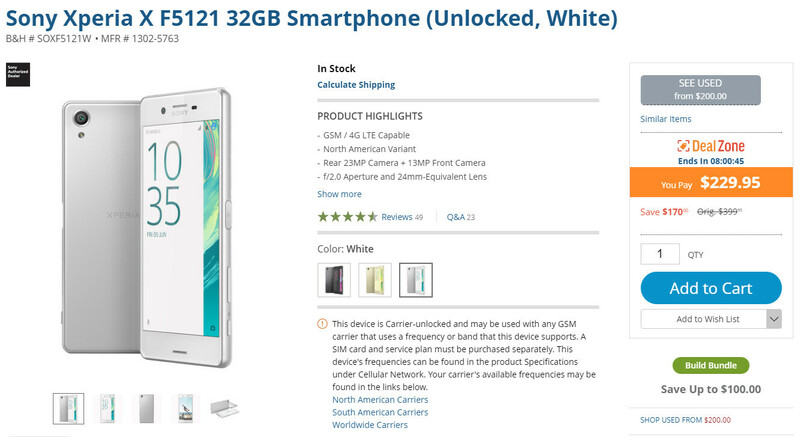 Deal: Sony Xperia X is on sale for just $230 (27% off) in the U.S.
Sony Xperia X, the smartphone that's been at the center of the Concept project, is once again on sale in the United States. Although most retailers in the country claim the phone's suggested retail price is $400, few sell the Xperia X for more than $300. Even so, B&H has a much better deal on the Sony Xperia X, which is supposed to end in about 8 hours from now. For a limited time, the Xperia X is up for grabs at B&H for just $230 outright, so you'll save at least $70 when you buy the phone. The retailer has the Xperia X available in three color options (black, lime gold and white), but only two of them are on sale right now (black and white). Even though B&H sells the North American version of the Xperia X, the unlocked model is not compatible with CDMA carriers in the U.S., but you can use it on AT&T and T-Mobile without any issues. Specs-wise, the Xperia X is still a decent mid-ranger, even if it was launched on the market last year. The phone comes with a 5-inch full HD (1080p) display and a 23-megapixel primary camera. It's powered by a 1.8GHz hexa-core Qualcomm Snapdragon 650 processor, coupled with 3GB RAM and 32GB of expandable storage. A secondary 13-megapixel selfie camera is included as well, along with non-removable 2,629 mAh battery. Too bad the dual has hybrid slot..